Get Free TV for life. Get local and international channels. Some people have received 100 channels from this HD Antenna. With it's razor thin design it can go virtually unnoticed in the house. It comes with 2 suction cups allowing for easy mounting. Comes with an extra long 10 Ft coaxial cord giving more flexibility to place inside the home. Easy setup. Just plug the antenna into the TV, Mount the TV on a window or anywhere that you can attach the suction cups, Scan for shows, and start watching TV. The Antenna also has Multi-Directional Design allowing for the antenna to pull in signals from all directions. 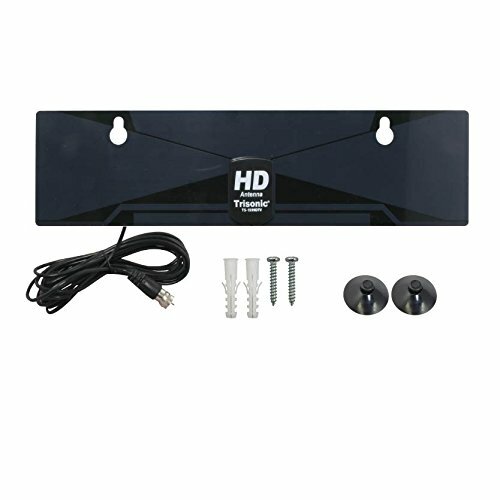 With this HDTV antenna you will receive local and international channels allowing you to watch shows in English, Spanish, Chinese and even Korean. If you have any questions about this product by Trisonic, contact us by completing and submitting the form below. If you are looking for a specif part number, please include it with your message.